In the beginning the fire hall was part of the Town Hall building, which was constructed in 1907. In 1876, the Rescue Fire Company was founded and was the first organized volunteer fire company to occupy the space. This is the oldest fire company in Northampton County. 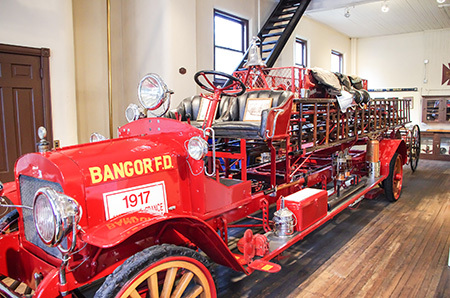 This exhibit houses Bangor’s first hook and ladder fire truck, a 1922, chain driven, American La France Brochway. The truck served Bangor from 1922 to 1955. Other notable exhibits for viewing include a 1907 Gamwell battery charger for alarm systems, various fire fighting equipment such as extinguishers, uniforms, helmets, and a plethora of photographs. Other attractions include a wooden water main and plug, a hose cart, and a chemical hose wagon. The hall not only displays the many items used by firemen in early years, but also the history of the honorable fire fighting service and how it has progressed through the decades. The rich tradition of the fire fighting service is emphasized along with their bravery. The exhibits display how fires were fought in the 1800’s and continue up to modern day in addition to painting the picture of the risks these courageous men faced. Throughout the year the Fire Museum will be displaying special exhibits and constantly adding additional exhibits. The fire museum will also be holding safety seminars for children in the near future.